I’m not sure how it really started, that I call the monks of Christ the King Priory “ My Favorite Monks”, but I’ve been calling them that for several years now. Once upon a time, I didn’t know ANY monks and now I have “favorite” monks. It was an advertisement in the Lincoln newspaper for a contemplative prayer retreat that brought me to St. Benedict Center (and the Monastery, across the street) in 2002. I am grateful to the monks who have shared their faith and wisdom through contemplative and guided retreats (dozens of them! 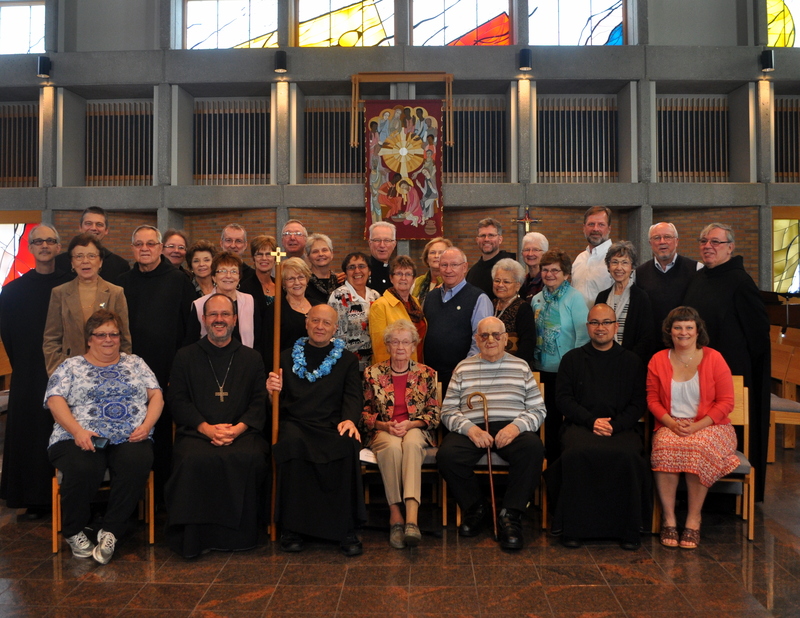 ), the Oblate program, in spiritual direction, confessions and by their lived example and friendship. St. Benedict Center has become my spiritual home; the monks and Oblates are family to me. I have learned so much from each of them about the pillars of Benedictine spirituality–work and prayer, silence, listening, hospitality, stability, conversion of life and obedience. “Some of the things that stand out to me about Fr. Volker are his love of books and taking pictures, his passion for leading the Oblate group and especially, how he makes others feel special. He shares countless books he has on a particular topic on Oblate days or at retreats. He carries dozens of books over from the monastery for us to look at, whetting the appetite of any book lover, and sending them all running to Brother Andrew at the bookstore seeking all those new titles. Perhaps there is nothing that he gets so excited about than showing others the thousands of photos that he’s taken of his trips or the turning of the leaves in autumn, or the blooming of flowers in the spring. But hardly is there a picture of him. He is the one always taking pictures of others—even quickly making prints for them to take home. But I think I topped him this summer—even HE said that I’ve taken more pictures of him than all of his life put together while on pilgrimage in Germany. When preparing for an Oblate day, you can tell that Fr. Volker combs the depths of his books, articles, songs, Scripture and Google to bring to us a rich experience and a new way to look at an old topic. Even unreliable technology, video or audio players will not stop him from sharing. What his interests say about him is that he pays attention to detail, that he focuses on the beauty around him, that he wants to share his joy with others. He keeps nothing for himself, but shares with everyone. Fr. Volker is the embodiment of hospitality. From my very first visit to St. Benedict Center in 2002, I knew I wanted to be an Oblate, but my journey to making my final oblation took 11 years. Throughout those years Fr. Volker would kindly ask me when I would be coming to a meeting. I would reply that I couldn’t make it every month, that I was busy with my little girl. He assured me time and again that I didn’t need to come every month; that I was welcome whenever I could make it. He even offered the hospitality of Fr. Thomas, saying that he could babysit Jessica while I attended the meetings. He continued to be hospitable and patient for all those years. Another time Fr. Volker extended his hospitality to my parents and aunt and uncle. We were all in Schuyler for a funeral and I wanted to show them the Center and Monastery. When we arrived, Fr. Volker came to greet us immediately, dropped everything he was doing and gave a behind the scenes tour of the monastery. I’ve seen now where he gets all of the books he carts over to the Center for Oblates and retreats. The next day was an Oblate meeting and I had hoped to stay overnight at the Center. When he asked me if I was staying, I said that there weren’t any rooms left at the inn. I was waiting for a cancellation or I would have to drive back to Lincoln and then drive back out again the next day for oblates. Immediately Fr. Volker said “You will stay here”. He showed me where to get coffee in the morning, carried my luggage and showed me to a guest room at the monastery. Just getting settled after he left, there was a knock at my door. It was Fr. Volker coming back to show me where blankets were in case I got cold. Leaving for the second time he said “Sweet dreams”. Another time that I stayed at the Center, I woke up to a blizzard (not heeding the weatherman’s advice the day before). My car doors were frozen shut. There was sleet, wind, snow, ice… I told Father that I was worried about my drive home. He said—“you have a co-pilot, you have an angel watching over you, you’ll be fine.” After Mass, as he often does, he walked me outside to head back to the Center. When we got outside, he realized the terrible conditions. He looked at me and said, “You will stay here”. That extra night we enjoyed taking hundreds of pictures of a foot of snow on Cornhusk Mary and watching a thousand photos of his trip to Sicily. And this is what it means to be one of my favorite monks. I guess when you do something for 50 years, you get really good at it. Like your speech very much! The first we got to know about Fr. Volker was his passion taking pictures and sharing all the beauty of his vacation trip with me and my wife!